An account-based strategy model needs to focus on re-establishing relationships. With a very-well-defined list of business-to-business contacts, the go-to-market strategy requires a disciplined approach to re-engage with customers. Unfortunately, most field organizations are saddled with tech-laden complexity. Constellation Research suggests that clients put human relationships back in the forefront. Using the Account Categorization Framework (ACF), go-to-market teams can assign prospects and clients to four archetypes. By tailoring strategies to each one, go-to-market teams can prioritize and personalize their efforts. The goal? To deliver a high-touch account-based program that wins over the trust of clients and prospects. 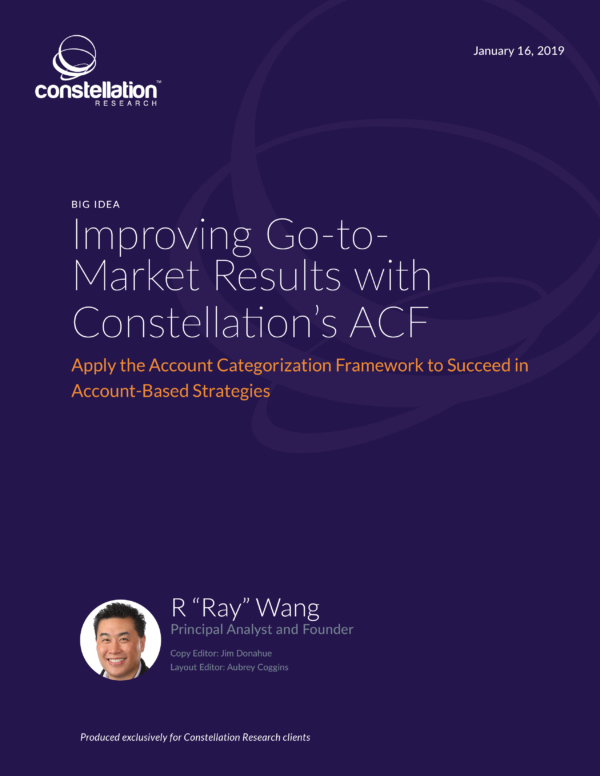 Constellation sees this ACF-driven approach as paramount for go-to-market team success for all sellers and marketers in all industries. Winning high-value accounts in today’s market isn’t about unleashing a massive team of salespeople who ultimately flail around, confused and made desperate by a tangle of siloed technology that’s supposed to help but only hinders. It’s time to take a breath and focus on building strong human relationships with a much more targeted and sensible approach. Ready to shift your account based strategies? Learn how to filter and prioritize accounts. Add your comments to the blog or reach me via email: R (at) ConstellationR (dot) com or R (at) SoftwareInsider (dot) org.